For small functions we configure and supply our top of the line gear - and other times we rely on carefully selected local suppliers, like this TVM mobile. But always.... always, we work to the same high standards. Once the shooting is done - we assemble all the video and audio components, work out details with the graphic artists, and use one of our multi angle editing systems to produce the final results. From a single camera to 24 or more - we can produce a product that meets your objectives. We work with you from the start. It begins wzith tough questions about your audience, your final distribution formats, your communications objectives and corporate values and culture. The answer is that the objectives must drive the decision process every step of the way. We have talented experts in computer animation, and a broad pool of expertise in design, writing, audio and video. 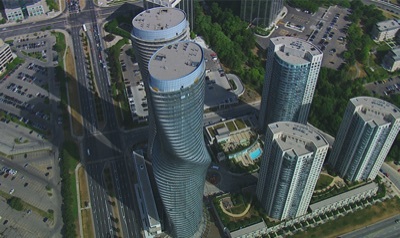 Innovation Two will often incorporate aerial perspectives in its video productions. We are very familiar with the process involved in directing aviation suppliers and the complexities of aviation. If your production would benefit from aerial shots, we have partners in aviation with access to stabilized HD cameras, including those that mount on single and twin jet commercial helicopters. Over the years we have shot and archived raw HD footage - and access to our existing and extensive libraries of aerial footage is part of what we bring to the table.